With the support of our craftsmen, we have been able to provide our clients with the best-in-class range of Stainless Steel Storage Ware. 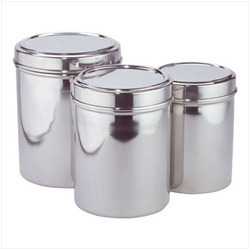 This range comprises Papad Dibba, Kadi Garma, Ubha Dibba, Puri Dibba and Canister. Designed to perfection, these offered products conform to the defined parameters of the industry and prevailing markets trends. Furthermore, to cater to the divergent demands of the customers, we offer these products in different sizes and significant designs. 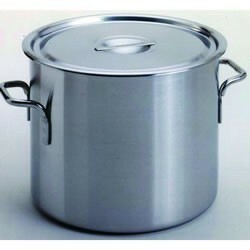 We have in store outstanding Stainless Steel Canister (Ubha Dibba) for our valued clients. The entire production process of these products is led by our diligent personnel They use high-grade stainless steel, which conform to the defined parameters of the industry. Furthermore, they develop these using technically upgraded machines while taking into consideration requirements of the clients. These products keep food safe and hygienic for longer time. With the assistance of our team, we have been able to hold expertise in designing and developing the best Puri Dabba. Our team manufactures these products using optimum-quality stainless steel and latest technology & machinery at sound manufacturing unit. They develop these products in different sizes, capacities and designs, thereby making us to meet diversified demands of the clients. 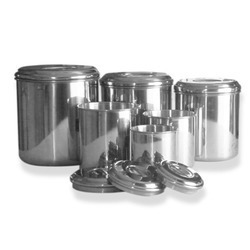 Leveraging on our vast industry experience, we are engage in offering commendable Stainless Steel Canister. Designed to perfection, these products conform to the defined parameters of the industry, signifying their high standards. Furthermore, in order to cater to the divergent demands of the clients, we offer these products in different sizes and capacities at an economical price. Our valued clients can avail from us significantly designed Kadi Garma. 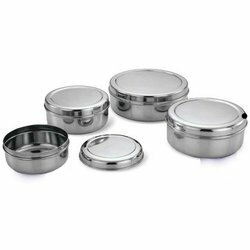 Developed with optimum quality stainless steel along with latest technology, these offered products meet defined parameters of the industry. We uniquely designed these products to satisfy expectations of the clients. These utensils are suitable for both cooking and serving purposes. Furthermore, we offer these products in different sizes, designs and capacities so as to meet multifarious demands of the clients.